Click for a map to our location from Dillon, MT. Click for hunting, info, pictures and Montana hunting tips. 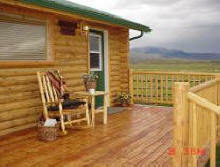 Enjoy Montana cabins on private land. Located in the heart of Montana's prime elk and deer country and just several miles from many blue-ribbon Montana trout fishing streams, Montana Guest Cabins are beautifully furnished log cabins, open year-round. 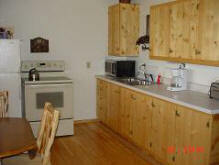 Each cabin, with a fully equipped kitchen, accommodates up to four or five adults. 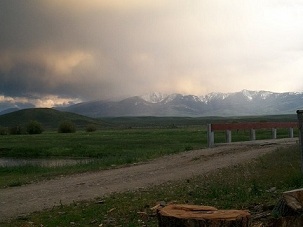 The cabins are located on a family ranch. Each cabin is like a studio apartment, with its own full bath. 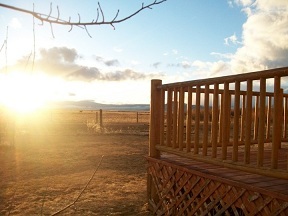 The deck is great for barbecuing and enjoying Montana beauty. Enjoy a Montana vacation! Plus 7% Montana accommodation tax. Family vacationers and honeymooners are welcome. Attention: Hunters and Fishermen! Click here! 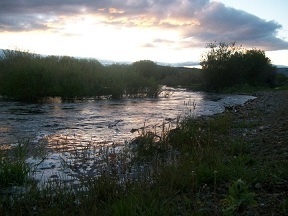 Horse Prairie Creek flows about 25 feet from the cabin doors. Cook your own meals in the fully equipped kitchen in each cabin. We do not have TV channels but have a wide variety of videos for free use on the cabin DVD player; high speed internet for movie streaming on your tablet. Yellowstone National Park is a three hour drive. Historical ghost town Bannack, Montana's first capital, is 15 miles from Montana Guest Cabins. Cancellation policy: Reservations for hunting season - 10% non-refundable downpayment at time of reservation. During the rest of the year 3 days notice on cancellation, no downpayment required. Master Card and Visa cards accepted. Dogs are allowed with prior permission, please ask us in advance; horses are welcome. *Non-smoking. Smoking is permitted on the deck. Directions: Cabins are located 30 miles southwest of Dillon. From I-15, take Exit 44, Clark Canyon Reservoir; travel west 10 miles. Turn at the first right past the 10 mile marker and drive down the road 2/3 of a mile until you see Montana Guest Cabins on the right. To check in, come to the main house about 100 yards behind cabins. Airports: Butte 90 miles north, Idaho Falls 120 miles south, Bozeman, 130 miles northeast. *$200 cleaning fee will be applied to those smoking in the cabins. 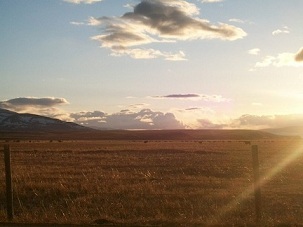 Click on this link to see all the happenings in Montana! The view out the back door of the cabins. End your day at a Montana Guest Cabin with a cup of hot chocolate on the front porch, resting on a hand-made pole glider, enjoying the spectacular sunsets.